What is the rationale of Indonesia's sovereignty over the Natuna Islands, despite its location in the 'middle of Malaysia'? The Natuna Islands are located in the middle of the South China Sea separating Peninsular Malaysia and the Malaysian Borneo states of Sabah and Sarawak. Pulau Serindit or more popularly known as Pulau Bunguran is the largest island of the Natuna group. The recognised international name for Pulau Bunguran is ‘Natuna’. Despite its geographical isolation, the Natuna Islands are actually located in the middle of an important trade passage linking East Asia and West Asia. With Ranai as its capital, the Natuna Islands comprise of 272 islands that are located off the south west coast of Sarawak. The special geographical location of the Natuna Islands may spur a question: what is the rationale of Indonesia’s sovereignty over the Natuna Islands that are located in the ‘middle of Malaysia’? Until 2010, the population of Natuna was about 69,003, comprising 35,741 male and 33,262 female population. About 85.27% of the population are Malays and the rest are Javanese, Sumatrans and the Chinese community. The main language spoken is Malay with Terengganese dialect with Islam being the main religion of Natuna. Historically, the Natuna Islands have always been mostly influenced by the Malay States of the Malay Peninsula. The first ruling government in Natuna was established in 1597 by royalties from the Malay Sultanates of Pattani and Johor-Riau. 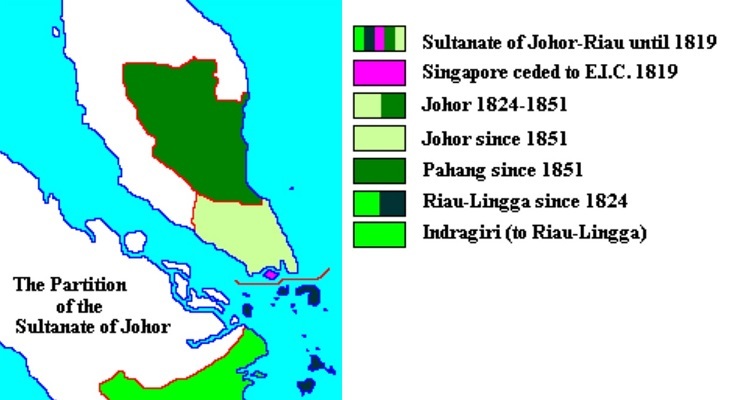 The Sultanate of Johor-Riau reached its pre-eminence in the 16th century having territories extending beyond Peninsula Malaysia to include Sumatra, the Riau Islands and the Lingga Islands in the South China Sea. Meanwhile, the Pattani Sultanate was a considerable power in the northern part of the Malay Peninsula ruling over the states of Kelantan, Terengganu and the modern Thai provinces of Yala, Narathiwat and Pattani. The Pattani influence over Natuna started when a princess from Natuna, Puteri Wan Seri Bulan married Datuk Bendahara Lingkai al-Fathani, a Pattani royalty. The son of this royal couple, Datuk Kaya became the first legitimate ruler of Natuna. The other notable rulers of Natuna was Wan Muhammad al-Fathani, who initiated relationships with the British. A prominent British officer of the Straits Settlements at that time, Lieutenant Colonel Butterworth presented a copper cannon to Wan Muhammad al-Fathani for his assistance rendered to a sunken British ship off the coast of Natuna on 25 January 1848. This proved the existence of close relationship between the rulers of Natuna with the Malay sultanates of the Malay Peninsula. The Malay Archipelago (Nusantara) is the largest archipelago in the world with Natuna Islands dotting right in the midde of it. Historically, the Malays were known as skillful seafarers and were active in trade resulting in the growth of a number of Malay port-cities of considerable importance such as Palembang, Malacca, Aceh, Pattani and Brunei. Nevertheless, the glory and wealth of these ports-cities have lured the Europeans to initiate their imperial ambitions over Nusantara. Malacca was the first port to be colonised by the Portuguese in 1511. The Dutch then took over Malacca in 1641. Meanwhile, the British established Fort Malborough in Bencoolen, now Bengkulu, in Sumatra in 1685. The imperial race over Nusantara between the Dutch and the British has caused dissatisfaction between these two powers. Ultimately, both the Dutch and the British concluded the Anglo-Dutch Treaty of 1824 on 17 March 1824 to end hostilities between them. This treaty has left an everlasting effect on the Malay Archipelago, dividing the Johor-Riau Kingdom which was an integral empire in the Malay World into spheres of the British and the Dutch. The Sultanate of Johor managed to retain its total independence for a few decades before it was made a British protectorate in 1914. The Sultanate of Johor exists until the present day, having been incorporated into the Federation of Malaysia. Meanwhile, its Riau-Lingga counterpart accepted Dutch overlord-ship and the sultanate was subsequently dismantled in 1911. MUST READ: Could the Federation of Malaysia really come apart? Article 10 of this treaty provided exclusive rights to the British to expand their influence over the Malay Peninsula while Article 9 of the same treaty recognised Dutch’s influence over the island of Sumatra and islands located south of Singapore. This treaty has perpetually separated Sumatra and the Riau islands from the Malay Peninsula and it lasted until today with the formation of modern nations of Malaysia and Indonesia. In general, one could contend that the 1824 Treaty did not spell clearly whether or not the Natuna Islands should be with the British or the Dutch. Nevertheless, the 1824 Treaty did mention that the Dutch will not expand their influence on the Malay Peninsula and on islands north of Singapore. Geographically, the Natuna Islands are located hundreds of kilometres north of Singapore. Based on this fact, Natuna should remain under the British sphere of influence during colonial times in the Malay Archipelago, and logically speaking, upon Malaysia’s independence, should remain with Malaysia. The Natuna Islands were made a territory within Indonesia based on the Letter of the Indonesian Delegation, Central Sumatra Province dated 18 May 1956. The kabupaten (regency) of Natuna Islands were created within the Riau Islands Province via Law No. 53, Year 1999 which took effect on 12 October 1999. The Natuna Islands were one of the main assets used by Indonesia in drawing its archipelagic baseline (garis kepulauan) to realise its vision to become the largest archipelagic state in the world. 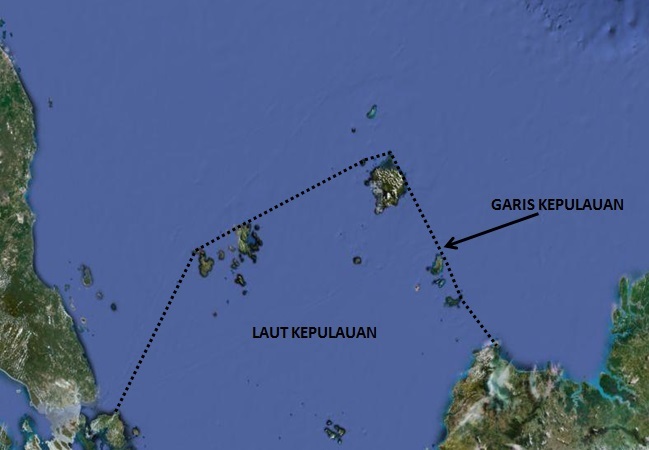 This would allow Indonesia to claim maritime areas enclosed within these baselines as its archipelagic waters (laut kepulauan). Map 3 above shows clearly that the Indonesian archipelagic baseline was not drawn in a straight line but the line bends northward to include Natuna Islands within its territory. If a line is drawn from the coast of Terengganu towards Sarawak, obviously one long straight line would pass across the Natuna Islands. Questions may arise as to why these islands are not with Malaysia. As stated earlier, Indonesia formally included Natuna Islands as part of its territory in 1956, a year before Malaysia’s independence and six years before the Indonesian Confrontation with Malaysia erupted. Malaysia at that time was still known as the Federation of Malaya and has not attained full independence to make its claim on the Natuna Islands. Malaya obtained independence in 1957 and became Malaysia in 1963. The smooth journey towards the formation of Malaysia was then compromised when the then President of Indonesia, Sukarno, declared confrontation against Malaysia in 1962. The Confrontation severed the Malaysian-Indonesian ties and may have swayed the focus of the leaders of Malaysia at that time towards ending the conflict with Indonesia rather than pressing claims over the Natuna Islands. On the other hand, Indonesia needed the Natuna Islands to justify to the world that Indonesia is in fact an archipelagic State as prescribed by the international law of the sea. Indeed, based on historical facts enunciated earlier, Malaysia has the right to claim sovereignty over the Natuna Islands. Nevertheless, the claim has never been made and until now, Malaysia recognises Natuna Islands as part of Indonesia. 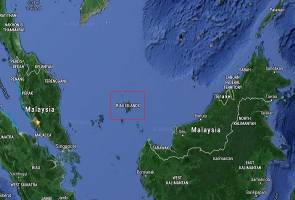 However, can Malaysia make prospective claims over the Natuna Islands? International law dictates that a State may acquire territory by way of prescription. This method of territorial acquisition refers to ‘actual exercise’ of sovereignty by one country on a particular territory without any clear objections from other countries. Based on this fact, Malaysia’s claim, if any, over the Natuna Islands may be rebutted on the fact that it has remained silent over Indonesia’s administration on those islands that has taken place for almost 60 years. The Natuna Islands used to have close relationships with sultanates of the Malay Peninsular. The 1824 Treaty, entered into by the British and the Dutch, may have placed the Natuna Islands within the British sphere of influence. However, these islands are now not under Malaysia’s sovereignty, creating an Indonesian enclave that separates Peninsula Malaysia and Malaysian Borneo in the South China Sea. Until now, Natuna Islands remain with Indonesia even though they are geographically and historically closer to Malaysia. Mohd Hazmi bin Mohd Rusli (Ph. D) is a senior lecturer at Universiti Sains Islam Malaysia and a visiting professor at Far Eastern Federal University, Vladivostok, Russia. Wan Izatul Asma binti Wan Talaat (Ph. D), is a professor at the Institute of Oceanography and Environment, University Malaysia Terengganu. The opinions expressed in this article are those of of the author's and do not necessarily reflect the view of Astro AWANI. Let's Talk: Can People To People Diplomacy Change the Conversation?